In April, the Fat Pitch Financials Portfolio returned 5.93%. This was slightly better than the 5.25% for the S&P 500. Year-to-date, the portfolio has returned 5.39%. However, the Fat Pitch Financials Port underperformed the S&P 500, which returned 5.93% year-to-date. 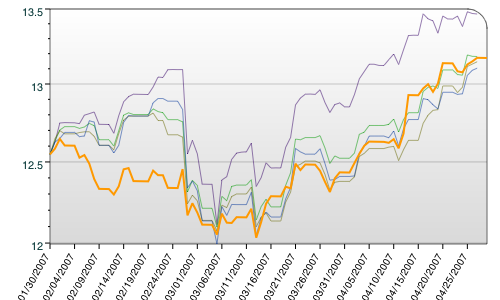 The chart below graphs the relative performance of the FPF Port versus several benchmark indexes. Surprisingly, my seven stock portfolio has closely tracked the three major indexes. The only major change this month was the addition of Broadridge Financial Solutions (BR)to the portfolio on April 10, 2007. I added 2,600 shares of BR for an average cost per share of $19.30. Today, Broadridge closed at $20.04. According to Marketocracy, this position is up 3.83%. Merck has been my hottest position this year so far. It has returned 19.82% YTD. USG has been the biggest lagger this year, dropping -14.93%. Since inception, the Fat Pitch Financials Portfolio has returned 31.35% or an 11.06% annualized return. Even though this is a fairly good rate of return, it still lags the S&P 500, which has experienced a 38.8% return during since the Fat Pitch Financials Portfolio was founded. One thing to note is that I still haven’t invested $321,340 of the original $1 million in this paper portfolio. This high cash level is similar to that of several professional value investors. I missed an opportunity to allocate some of this capital a few weeks ago during the minor market correction. However, I’m still waiting for a fat pitch opportunity associated with a major market correction in order to invest the remaining cash in this portfolio. Given that some of the stocks in the portfolio have appreciated significantly, there is the potential that I will end up with even more cash if I sell any of these positions.